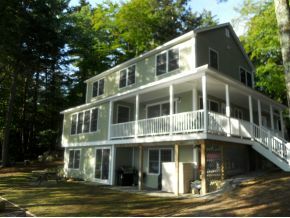 This Immaculate Lake Winnipesaukee waterfront home was built for entertaining and has room for the extended family and friends too. Just 7 years old this home looks brand new and it has a bright and airy feel with light streaming in from everywhere; there's an emphasis on comfort with plenty of get away spaces built into three finished floors of living area. Privately set on an over-sized, level lot with nearly 300' of water frontage, an L shaped dock with deep water and a sandy swim area. Additional features include 2 separate hot air furnaces, hardwood flooring throughout, high ceilings, custom lighting and a maintenance free 67' wrap round farmer's porch as close to the water's edge as you'll find. Listed by Prudential Spencer-Hughes, Lake Winnipesaukee is over 42,000 acres, in the summer you can boat to restaurants around the lake and in the winter you can enjoy a day of skiing at Gunstock Ski area just minutes away or get on your snowmobile and go to lunch in Wolfeboro or Meredith. This 14 room, 4 bedroom and 4 bathroom home has the comforts you desire.